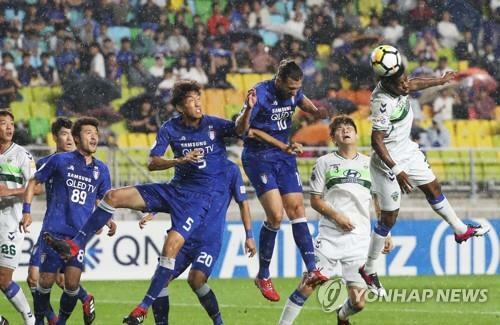 SUWON, South Korea, Sept. 19 (Yonhap) — Suwon Samsung Bluewings edged past fellow South Korean club Jeonbuk Hyundai Motors to reach the semifinals of the 2018 Asian Football Confederation Champions League (ACL) on Wednesday. Suwon advanced to the last four after beating Jeonbuk 4-2 on penalties at Suwon World Cup Stadium in Suwon, south of Seoul. The two K League 1 teams entered the penalty shootout after they were tied 3-3 on aggregate and went scoreless in extra time. Suwon entered the second leg at home with a three-goal advantage. But Jeonbuk overcame the deficit by winning the second leg 3-0 and forcing the winners to be decided in extra time action. Suwon goalkeeper Shin Hwa-yong was the hero of the night. He made two crucial saves in the penalty shootout to lead his team to victory. The 35-year-old also denied Carlos Adriano’s penalty kick in the second-half stoppage time. Suwon, two-time continental champions, will make their first semifinals appearance since 2011. They will next face Kashima Antlers of Japan in the two-legged semifinals starting next month. On a rain-soaked pitch, Suwon opted for counterattacks and focused more on defense. Jeonbuk, the 2016 ACL champions, dominated possession and aggressively moved forward to score goals. Jeonbuk showed their firepower from the 11th minute. Ricardo Lopes sent a cross into the box that found his Brazilian teammate Carlos Adriano, who tucked the ball with his left foot for a 1-0 lead. Playing without their captain and playmaker Yeom Ki-hun, Suwon had a hard time finding a breakthrough in their offense. The hosts had no shots in the first half. The visitors further pressured Suwon in the second half, and center back Choi Bo-kyung made it 2-0 with his header off a Lee Seung-gi corner kick in the 51st. Needing one more goal to force the match into extra time, Jeonbuk replaced Choi for veteran striker Lee Dong-gook in the 54th. Suwon nearly quashed Jeonbuk’s rally with Han Eui-kwon’s left-footed strike in the 64th following a through ball from Elvis Saric. His attempt, however, flew over the net. Jeonbuk put Kim Shin-wook in for Lopes in the 66th, hoping the towering striker could boost their attack. And the 198-centimeter man didn’t disappoint, as he headed down Lee Yong’s cross in the 71st to make the teams even on aggregate score. Kim then almost scored his second goal in the 80th with his right-footed effort after receiving a pass from Han Kyo-won. Suwon’s Dejan Damjanovic answered back seconds later with his left-footed strike couldn’t find the net. With four minutes added for stoppage time, Jeonbuk earned a penalty kick in the 91st after Adriano was brought down by Jo Sung-jin in the box. Adriano stepped up to score the winner, but his spot kick was denied by Shin and the match entered extra time. In the extra time action, Suwon’s Kim Jong-min saw his shot rattle the crossbar in the 95th following a deflection off Jeonbuk center back Kim Min-jae. A minute later, Jeonbuk striker Kim Shin-wook’s attempt went inches wide of net, also taking a deflection off the opponents’ defender. Both teams ran out of gas and lacked concentration near the box in the second half of extra time. Jeonbuk midfielder Lee Seung-gi’s middle-range strike in the 114th was the only promising effort produced by the two sides. In the penalty shootout, Suwon’s Shin Hwa-yong first blocked Kim Shin-wook’s attempt and later denied Lee Dong-gook’s kick. None of the Suwon kickers missed a shot against Jeonbuk goalkeeper Song Bum-keun. Suwon’s fourth penalty kick taker Saric ended the long fierce battle by scoring his spot kick.